A Ynet investigation revealed Wednesday that the hijacking of the Russian vessel 'Arctic Sea' was ordered by the Russian government. News agencies around the world published reports tying Israel to the hijacking, as the vessel was said to have been carrying arms to the Middle East, and possibly Iran. The Arctic Sea went missing in July while en route from Finland to Algeria. Its disappearance sparked reports of a first incident of piracy in European waters in modern times. Admiral Tarmo Kouts, the European Union's rapporteur on piracy, told Time Magazine he believed the Arctic Sea was intercepted by Israel as it carried a secret cargo of S-300 anti-aircraft missiles and X-500 anti-ship missiles to the Middle East. A Ynet investigation based on a number of Russian, European, and Middle Eastern sources has concluded that the admiral's thesis is not plausible for a number of reasons. For example, the missiles' route to Finland remains unclear, as well as the Mossad's reasons for hijacking the ship rather than arresting it mid-route and unloading the supplies. The Kremlin has so far kept silent on the matter, after having arrested the alleged hijackers on August 18 and charging them with kidnapping and piracy. It has made no comment on reports speculating Israel was behind the deed, and Jerusalem has followed suit. The investigation has revealed that the ship first set sail not from Finland, but rather from the Russian exclave of Kaliningrad. Located on the Baltic shore, the area has been historically considered a closed military zone. The Kaliningrad port, manned by the Russian navy, holds missile batteries which include S-300 anti-aircraft weapons. The Kremlin has declared the city a free trade zone but it is considered to be ruled and operated by unions of former soviet security forces, and a hotbed of illegal trade that includes various types of weapons. Sources say the Arctic Sea docked in Kaliningrad in June to undergo various repairs. The same sources say a deal was previously struck between Russian and Middle Eastern businessmen, agreeing on the sale of some of the S-300 missiles located at the port. Some sources claim the Russian military's weapons industry was implicated in the deal and transferred a number of new missiles, including the X-500, to the port to be included in the sale. However the Kremlin was uninvolved, and apparently the deal was carried out in secret between businessmen from the private sector. After the deal was executed, an intelligence agency whose identity so far remains unexposed learned of the ship's departure with the weapons in tow towards Algeria, a country located on a regularly used route for the transfer of weapons to Iran and Syria. The intelligence agency then transferred an anonymous tip to the Russian authorities, according to the investigation. Then, two days after the Arctic Sea sailed from a Finnish port where it apparently picked up timber in order to cover up the missiles, a motorboat carrying eight people drew up to the ship and asked to board due to having been lost at sea. The eight then identified themselves as Swedish police and arrested the crew under gunpoint. The Russian sailors serving on the Arctic Sea said the officers spoke Russian between themselves. Twelve hours later the ship's crew reported the incident to the Swedish authorities and said the hijackers had impersonated Swedish police. The crew said the hijackers had left the ship but in actuality they remained, holding the crew hostage. On April 28 the British coast guard contacted the ship, and its captain reported everything was fine. 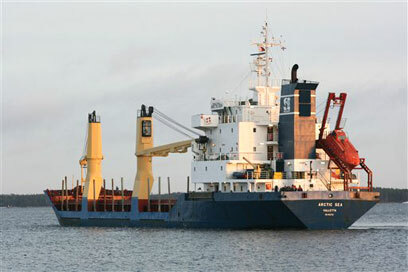 The vessel was allowed to continue sailing towards Algeria and shortly afterwards all contact with it was lost. According to Russian sources the "hijackers", who in actuality were Russian intelligence officers, remained on the ship and reported to their superiors that they had found the missiles on board. On August 12 Russia announced it had sent naval officers to rescue the vessel and its crew. The sources say the period of time between the hijacking and the Russian rescue mission was due to the Kremlin's desire to capture the ship away from the eyes of the media, in order to avoid an embarrassing incident that may have harmed its relations with Iran and Algeria. But Russia also desired to avoid an incident with Israel and the US, the sources say. Four years ago the country signed a deal with the two allied nations promising to refrain from transferring "destabilizing" arms to Syria or Tehran. The S-300 missiles were specifically included in the accord. On August 18 Russian commando forces overtook the ship and arrested the hijackers. Pictures released to the press show Russian soldiers forcing the eight men harshly onto land. The cargo was taken to an undisclosed location in Russia by eight large cargo planes immediately after the incident was made public. See all talkbacks "Report: Russia hijacked its own ship"